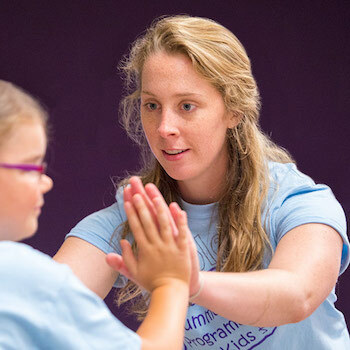 These days, when children arrive for their afterschool class at KidsAbility, they’re ready to do some Movin’ and Groovin’ – which is apt, since that’s the name of the Laurier-run program. For an hour, they’ll dance, do some yoga and participate in fitness games. They’ll share what they did to keep active that week – one girl likes to show off her cheerleading moves. Some tell stories to go with the yoga. The kids have made a lot of progress. When Laurier Kinesiology PhD candidates Nicole Reinders and Brianne Redquest started the program, some had trouble participating at all. One boy wouldn’t even enter the room – he watched through a window. Now he “flies in,” says Redquest. Another boy hid during circle time. Now he’s comfortable leading yoga sessions, says Reinders. Redquest and Reinders have run Movin’ and Groovin’ for children and youth with disabilities since 2015. They’ve had a huge range of participants – ages four to 17, with disabilities including autism spectrum disorder, Down syndrome, cerebral palsy and spina bifida – plus typically developing siblings. Though participants in recent sessions have mostly been aged seven to 12, they still vary widely in their abilities and needs. That’s why all participants with disabilities have at least one volunteer, normally a Laurier student, working one-on-one with them throughout the weekly session. The goal is to create an inclusive environment where every child can feel comfortable and accepted while being physically active and learning about healthy habits. “We meet each kid where they’re at and work on skills from there,” says Reinders. In the summer, the students also run a half-day camp called Bodyworks, which includes the Movin’ and Groovin’ content as well as other activities such as crafts, playground time and trips to the pool. Both the camp and weekly program take place at the Waterloo site of KidsAbility. Laurier Kinesiology and Physical Education Professors Pam Bryden and Paula Fletcher initially conceived the idea of the program and secured initial funding, but Redquest and Reinders designed the content, recruited volunteers and run the program. “It’s so important to our community to be able to offer physical activity programs to all children, regardless of ability or fitness level,” says Bryden. Although Redquest and Reinders haven’t directly studied the Movin’ and Groovin’ participants – at least not yet, they say engaging with the children has influenced their research, which in both their cases has to do with physical activity and children with disabilities. “I’m a firm believer that you can read and research as much as you want about disabilities, but it’s not until you’re actually working one on one with these individuals that you really learn strategies and techniques and learn about the children themselves,” says Redquest. True to the concept of experiential learning, Reinders says her hands-on experience in the Movin’ and Groovin’ program has influenced how she plans to collect research results. For instance, she was originally planning to perform physical tests of strength, balance and skills to assess outcomes. Their academic research has also influenced how they approach running the program, says Reinders. For instance, she now knows to break down each part of a complex movement such as swinging a bat. The virtuous circle of research and practice is what keeps both students running the program despite all the organizational work on top of their normal graduate student busy-ness.